Looking over the program for the festivities commemorating the 50th anniversary of the civil rights March on Washington, and Dr. Martin Luther King Jr.'s famous "I Have a Dream" speech, it's hard to not feel sober about the whole thing. I say sober because there is good news and bad news. There has been monumental progress in the quality of life, on average, that black Americans lead today. Fifty years is a long time, and the progress is not nearly what it should be or could have been. Unfortunately, the program for the "50th Anniversary March on Washington," posted on the website of that name, shows that liberals who control the event have little interest in serious thought about why there have been failures. Needless to say, the event is devoid of a single black conservative spokesperson. Few would have dreamed in 1963 that within 50 years a black man would be president of the United States -- let alone twice elected. We've got black millionaires, even a couple black billionaires. The inherent stigma of race has changed dramatically. According to a recent Gallup poll, 87 percent of Americans approve of marriage between blacks and whites, compared to only 4 percent who approved in 1959. Among white Americans, 84 percent approve of black-white marriage today, compared to just 17 percent in 1969. Institutional racism is no longer legal in America, and acceptance of black Americans as every bit as human and normal as white Americans is in much better shape today than 50 years ago. But the overall picture of black America is not good. According to the Census Bureau, the median net worth of black households in 2010 was $4,955 compared to a median white household net worth of $110,000. Median black household income in 2011 was $32,229 compared to median white household income of $52,214. Comparing median household income by ethnicity -- white, Hispanic, Asian, black -- it's lowest for blacks. Black liberals want us to believe that huge economic disparities persist today between black Americans and the rest of the nation because of racism and continuing civil rights injustices. Fifty years ago, blacks faced major institutional barriers to living in America as free, normal citizens. As result of the civil rights movement and passage of the Civil Rights Act in 1964, barriers that allowed differential treatment under the law and permitted institutional racism were dismantled. Of course, there are still individuals with us who carry racial prejudice in their hearts. But to suggest, as liberals do, that institutionalized racial injustice explains today's disparities in educational and economic achievement between black and white America is to assure that disparities will continue and that the real problems will never be addressed. 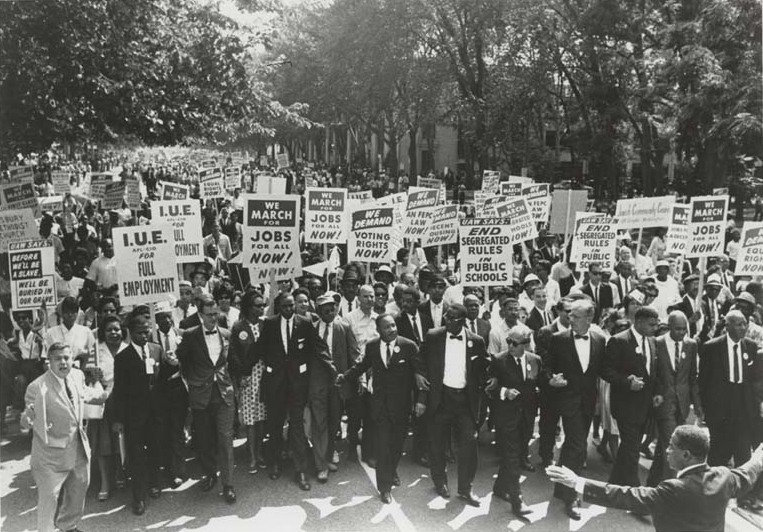 The "50th Anniversary March on Washington" does our nation a disservice by going beyond just commemorating a great achievement and suggesting that disappointing progress is because that achievement was incomplete. Organizers suggest that blacks lag behind today because many "continue to suffer civil and economic injustices." Not true. Black Americans are today free. It may be fun to come to Washington to remember and celebrate. But the answers for blacks today are not in Washington. They are in black homes, black schools, black hearts and black minds. We need today a Personal Responsibility Movement. If it had gotten started in 1964 with the Civil Rights Act's passage, blacks would be in far better shape today. Instead, too many turned to government for programs. It's why increasing numbers of black Americans are now looking to a conservative agenda that honesty examines and looks to fix what is broken in black communities and correctly identifies these as mostly moral rather than political challenges.